Extradural hematoma (EDH) in an infant is a very rare entity. The presentation, the site, and the course of EDH in infants are quite different from that in adults. In about 85% of EDH in infants, there is no loss of consciousness, and hence a high degree of suspicion is required not to miss the diagnosis in infants harboring life-threatening EDH. Because the developing brain in infants is more compactly fitted to the skull, a small increase of volume in intracranial compartment raises the intracranial pressure (ICP) more alarmingly. Again the EDH and scalp hematoma are sufficient enough to produce anemia and shock as the total blood volume is less in infants. So they need early surgical intervention for EDH and blood volume replacement. An 8-month-old infant slipped from his mother's lap as she fell down from motor cycle near a hump while traveling as a pillion rider. Commonly, the ladies in this part of the country sit on the bike as a pillion rider facing to one side so that they are more vulnerable to fall on slight acceleration or deceleration. The child cried immediately after fall and after a while slept calmly. Later he vomited twice after taking mother's milk. So, the child was taken to a local hospital where he was prescribed with antiemetic syrup and discharged. In the next 2 days parents noticed that the child had become more irritable although his feeding was normal. They also noticed gradual increase in the size of scalp swelling. So, the apprehensive parents brought the infant to neurosurgery outdoor. On examination, the baby was conscious, taking mother's milk normally without vomiting. No neurological deficit was detected. A computerized tomographic (CT) scan of head was done which showed right parietal EDH with midline shift of 3 mm [Figure 1]. The blood hemoglobin was 9 gm%. There was no associated skull fracture. The child was operated under general anesthesia in supine position with head turned to left. A curved right parietal skin incision with the base of the flap laterally was given. Osteoplastic craniotomy was done after making four burr holes by Hudson's brace. The EDH was evacuated, dural hitch was given, the bone flap was reposed and skin stitched. The postoperative period was uneventful. (ii) The unfused sutures and presence of fontanelles make the infant skull more elastic. Changes in the level of consciousness are absent in about 50% cases even at the time of injury. In such cases, EDH is detected only after doing a CT scan which is done due to the presence of subgaleal hematoma or cephalohematoma. Choux and colleagues reported that 85% infants with EDH have no loss of consciousness at the time of impact and 7% have no alteration in consciousness at any time following injury. Unconsciousness is conspicuously absent because of the absence of diffuse axonal component. Clinically significant life-threatening intracranial mass lesion can exist in children with no significant initial clinical manifestation. Irritability is the most common presenting symptom as the infant cannot complain anything. The cause might be due to headache as a result of raised ICP. Pallor and anemia are reported in 88%, 90%, and 96% cases by Yusuf and colleagues,  Pasagalu and colleagues  and Ceurea AV,  respectively. The radiological indication for surgical intervention is (i) hematoma volume larger than 30 ml, (ii) thickness of >15 mm, and (iii) midline shift >5 mm. Surgical intervention is also indicated in symptomatic patients with altered sensorium, focal neurological deficit, presence of temporal or posterior fossa EDH or with associated intracranial lesions. ,,, Smaller EDH in sites other than temporal or posterior fossa may be managed conservatively with careful observation. ,,, In these cases, the time interval between initial CT scan and time of injury is very important. The reported mortality rate of EDH in infants is 0% to 17% ,,, and 6.5% by AV Ciurea in their series. Most of the extadural hematoma in infants are asymptomatic although there may be a large extadural hematoma endangering life of the infant. Hence, any head injury in infants needs special attention and a high level of suspicion, especially when the infant is having a scalp hematoma or pallor. Early detection and proper management can reduce the mortality rate of extadural hematoma in infants with good results. Considering the risk of radiation in infants, difficulty in taking the history, varied symptomatology than the adults, and the risk of early coning, the clinician is always in a dilemma whether to advice CT scan in all infants with head injury. 1. Choux M, Grisoli F, Peragut JC Extradural hematomas in children. Childs Brain 1975;1:337-47. 2. Dhellemmes P, Lejeune JP, Christiaenes JL, Combelles G. Traumatic extradural hematomas in infancy and childhood. J Neurosurg 1985;62:861-4. 3. Erºahin Y, Mutluer S, Güzelbag E. Extradural hematoma: Analysis of 146 cases. Childs Nerv Syst 1993;9:96-9. 4. Cordobes F, Lobato RD, Rivas JJ, Munoz MJ, Chillon D, Portillo JM, et al. Observation on 82 patients with extradural hematoma. J Neurosurg 1981;54:179-86. 5. Ciurea AV, Kapsalaki EZ, Coman TC, Roberts JL, Robinson JS 3 rd , Tascu A, et al. Supratentorial epidural hematoma of traumatic etiology in infants. Childs Nerv Syst 2007;23:335-41. 6. Mazza C, Pasqualin A, Feriotti G, Da Pian R Traumatic extradural haematomas in children: Experience with 62 cases. Acta Neurochir (Wien) 1982;65:67-80. 7. Rocchi G, Caroli E, Raco A, Salvati M, Delfini R. Traumatic epidural hematoma in children. J Child Neurol 2005;20:569-72. 8. Greenberg S, Greenberg M, editors. Handbook of neurosurgery. 5 th ed. New York: Thieme; 2001. p. 306-18. 9. Tagaki T, Nagai R, Wakabayashi S, Mizawa I, Hayashi K. Extradural hemorrhage in the newborn as a result of birth trauma. Childs Brain 1978;4:306-18. 10. McKissock W, Taylor JC, Bloom WH, Till K. Extradural hematoma: Observations on 125 cases. Lancet 1960;2:167-72. 11. Seeling JM, Marshall LF, Toutant SM, Toole BM, Klauber MR, Bowers SA, et al. Traumatic acute epidural hematoma: Unrecognized high lethality in comatose patients. Neurosurgery 1984;4:465-73. 12. Gutierrez FA, McLone DG, Raimondi AJ. Epidural hematomas in infancy and childhood. Concepts Pediatr Neurosurg 1981;1:188-201. 13. Pasaglu A, Orhon C, Koc K, Selquklu A, Akdemir H, Uzunoglu H. Traumatic extradural haematomas in pediatric age group. Acta Neurochir (Wien) 1990;106:136-9. 14. Harwood-Nash DC, Hendrick EB, Hudson AR. The significance of skull fractures in children. Radiology 1971;101:151-5. 15. Dias MS. Traumatic brain and spinal cord injury. Pediatr Clin N Am 2004;51:271-303. 16. Luerssen TG. Head injuries in children. Neurosurg Clin N Am 1991;2:399-410. 17. Bruce DA, Schut L, Sutton LN. Cephalohematoma and subgaleal hematoma. In: Wilkins RH, Rengachary SS, editors. Neurosurgery. New York: McGraw-Hill; 1985. p. 1622-3. 18. Obana WG, Pitts LH. Extracerebral lesions. Neurosurg Clin N Am 1991;2:351-72. 19. Chen TY, Wong CW, Chang CN, Lui TN, Cheng WC, Tsai MD, et al. The expectant treatment of basymptomatic supratentorial epidural hematomas. Neurosurgery 1993;32:176-9. 20. Bejjani GK, Donahue DJ, Rusin J, Broemeling LD. Radiological and clinical criteria for the management of epidural hematomas in children. Pediatr Neurosurg 1996;25:302-8. 21. Rusin J, Broemeling LD. Radiological and clinical criteria for the management of epidural hematomas in children. Pediatr Neurosurg 1996;25:302-8. 22. Beni-Adani L, Flores I, Spektor S, Umansky F, Constantini S. Epidural hematoma in infants: A different entity? J Trauma 1999;46:306-11. 23. Illingworth R, Shawdon H. Conservative management of intracranial extradural haematoma presenting late. J Neurol Neurosurg Psychiatry 1983;46:558-60. 24. Pang D, Horton J, Herron JM, Wilberger JE Jr, Vries JK. Non-surgical management of extradural hematomas in children. J Neurosurg 1983;59:958-71. 25. Pozzati E, Tognetti F. Spontaneous healing of acute extradural hematomas: Study of twenty-two cases. Neurosurg 1986;18:696-700. 26. Sakai H, Takagi H, Ohtaka H, Tanabe T, Ohwada T, Yada K. Serial changes in acute extradural hematoma size and associated changes in the level of consciousness and intracranial pressure. J Neurosurg 1988;68:566-70. 27. Jamieson KG, Yelland JD. 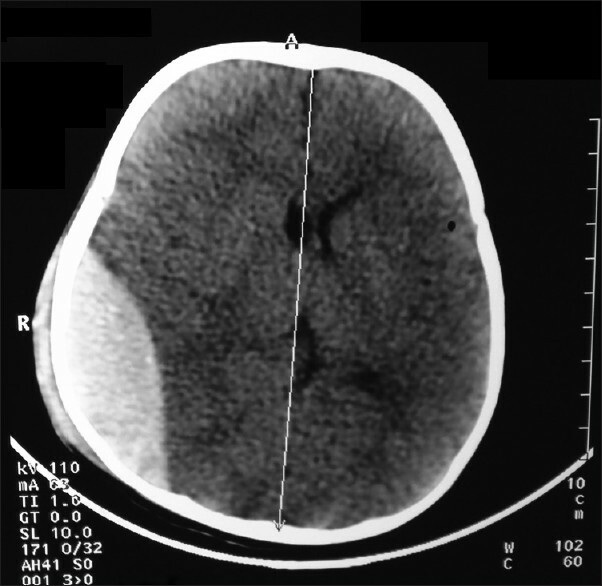 Extradural hematoma. J Neurosurg 1968;29:13-23.